2K have released some numbers collected from the open beta of their multiplayer brawler Battleborn, and we’re not sure what to make of any of them. Need something to play with your pals? Here are the best co-op games on PC. 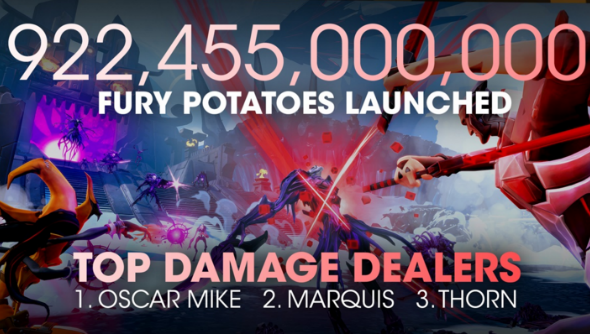 The infographic shows the extent to which Battleborn was played during its short beta period last week. Ok, first off, 2 million players, that we can handle. That’s quite a lot of people trying out Gearbox’s MOBA-ish class-based FPS. Between them they played 1.1 million competitive multiplayer games, and 1.4 million story episodes. Players also collected 27 billion Shards, the in-game currency that allows upgrading of gear or buildable structures. A total of 57 billion life points were healed too, with Miko, Ambra and Rath being the top healers from the game’s 25-character roster. After that it’s anyone’s guess. Someone called Geoff attempted to be a spider 1,670,000 times, presumably being stopped by players before completing his lifelong dream. Whatever Varelsi portals are, 825,000 of them got voided. And if you know what fury potatoes are then maybe you can help us understand why almost a billion of them were launched, and how that makes you feel, below.